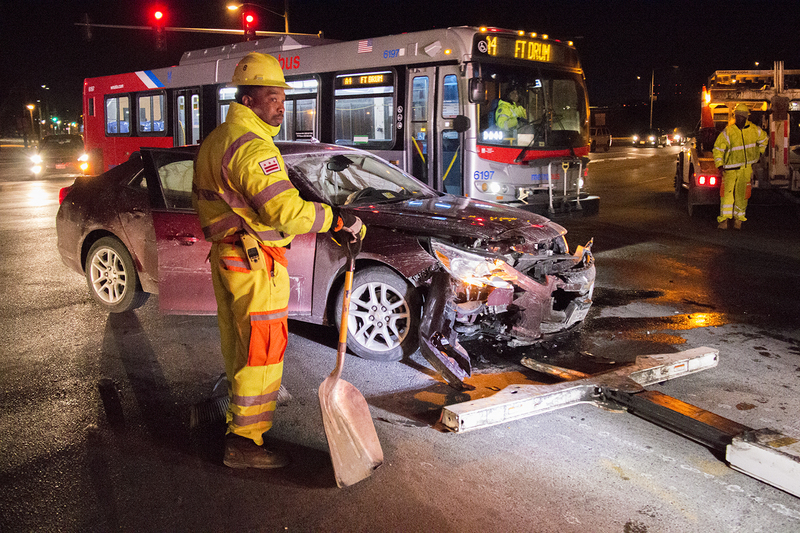 ROP transportation assistant Byron Beckham cleans up the scene of a crash at Suitland Parkway and Firth Sterling Avenue SE. It was 20 degrees and Roadway Operations Patrol (ROP) transportation assistant Byron Beckham was helping to nudge a towbar under the collapsed hull of a maroon sedan. In the next few minutes he’d sweep up the assortment of glass, metal and plastic shards still left at the scene and spread a chemical absorbent so passing vehicles wouldn’t slip on the freshly-spilled oil. It was 6 am, and Mr. Beckham’s day was just getting started. Mr. Beckham’s shift usually starts at 5 am, which coincides with the uptick in vehicular crashes during the morning rush hours. The frequency of crashes that the ROP team responds to on weekdays is at its highest point from 6 am to 10 am. This is attributable, says Mr. Beckham, to a dangerous cocktail of tired third shift drivers and under-rested commuters rushing to get to work on time. On the weekends, the majority or ROP’s responses fall between 10 pm and midnight. 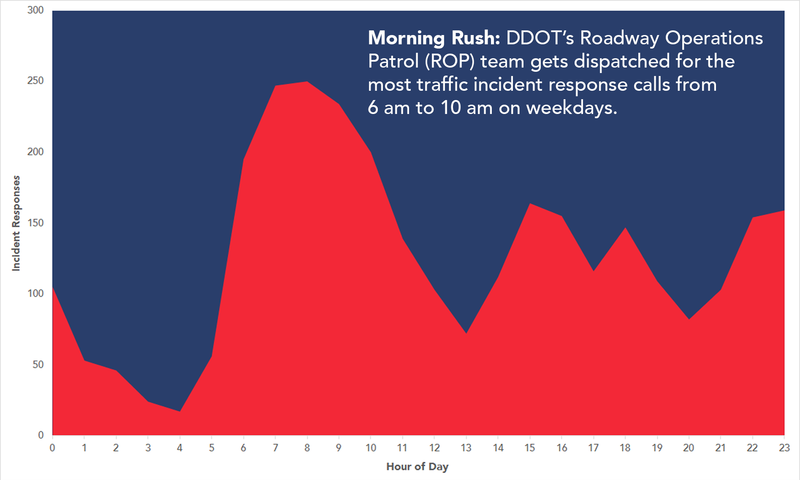 DDOT’s ROP team receives the highest amount of calls for assistance on weekdays during the morning rush hours. The bulk of the incidents that the ROP team responds to are related to disabled vehicles and traffic crashes, which collectively accounted for 81 percent of ROP’s service calls in 2017 (1,697 disabled vehicle responses and 1,350 calls to the scene of traffic crashes). However, the situations that DDOT’s ever-mobile good Samaritans are called to respond to run the gamut: from traffic control (170 incidents in 2017), to vehicular fires (16) and Hazmat spills (5). DDOT recently installed CCTV cameras on four of its ROP vehicles. Because the ROP team covers so much ground in the District and is a vital presence at precarious scenes, DDOT outfitted four ROP vehicles with rotating CCTV cameras earlier this year to be the agency’s eyes in the fields during critical situations. 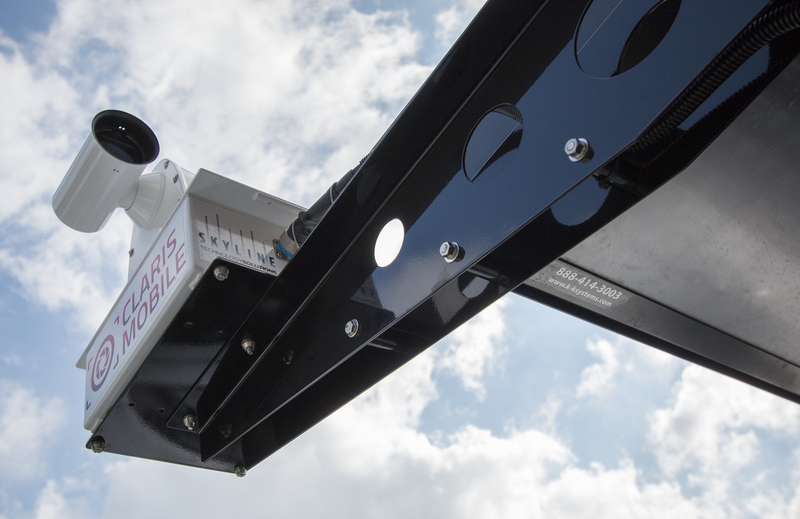 The live feeds from these cameras, which are securely bolted on beams attached to ROP’s trucks, can be viewed by DDOT traffic management personnel and other agency officials. Be safe out there, and if you should need our help please don’t hesitate to ask for ROP’s assistance by calling DDOT at 202-671-3368. Note: DDOT recorded the CCTV camera footage above manually for the purposes of this blog post and does not record or archive footage from the its CCTV cameras.